Above are swatches on my own arm (I have fair skin with a yellow undertone). 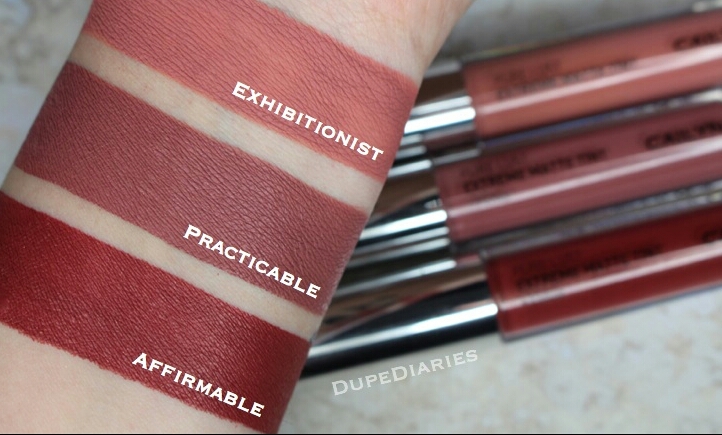 “Exhibitionist” is a Pure Lust Extreme Matte Tint (The product is thin and lightweight. It glides on with ease). This shade is very pigmented desire how thin the product feels during the application. It dries down quickly to a matte and is not sticky or patchy. 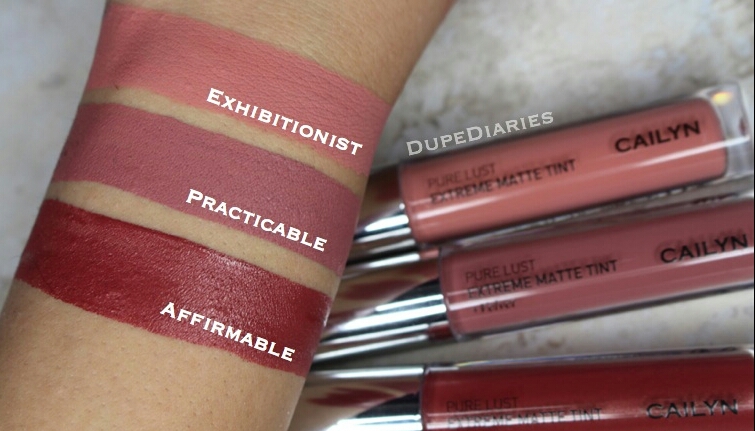 “Practicable” and “Affirmable” are both Pure Lust Extreme Matte Tints + Velvet (These are thicker than the regular mattes without the “+Velvet,” they glide on much creamier but dry down matte and lightweight) I noticed that these took a bit longer to dry down to matte, once they do they no longer feel as thick and creamy. The feel of them when dried down is similar, if not the same, to that of “Exhibitionist.” While they are drying they do have a slight stick till they dry down completely. The wand wand shown up above is the want of these liquid lipsticks and I like it. I think it makes it easy to apply the product on easily and really be precise on filling in your lip. Basically they last a really long time and so far I haven’t noticed them to crack or crumble on me throughout the day. Scent wise, they do have a scent but it’s not a food type scent… it’s neither amazing nor bad. Overall do I like these liquid lipsticks? Yes. The color selection is really pretty and in this case, these three shades were easy go to colors. The pigmentation of these is good, they’re lightweight, not sticky, I didn’t have any issues with them drying my lips, and they’re quite comfortable. The only thing I didn’t like is how hard they are to take off, but I guess it’s a good thing if you’re planning on not retouching your makeup all day.